Own Die Hard - Anniversary Edition 4K Ultra HD from Deff, DVD, Blu-Ray & 4K Video Specialists - Free UK Delivery..
A true Hollywood superstar. One of the greatest movie characters of all time. When Bruce Willis exploded onto the big screen as John McClane, a smart, funny, one-of-a-kind New York City cop who lands in one-of-a-kind predicaments, millions of fans worldwide cheered him on, and the bar for action films was forever raised! Now available in one action-packed Blu-Ray collection are all five Die Hard films, in stunning high definition. Die..
Own Die Hard - Legacy Collection (5 Films) Blu-Ray from Deff, DVD, Blu-Ray & 4K Video Specialists - Free UK Delivery..
A true Hollywood superstar. One of the greatest movie characters of all time. Celebrate 25 years of Bruce Willis playing John McClane with the 6-Disc Collection featuring the first five Die Hard films and a bonus disc, "Decoding Die Hard." It's the ultimate tribute to the tough-as-nails cop with a wry sense of humour and a knack for explosive action. Wrong place. Wrong time. Right man. Yippee ki yay! Die Hard: In the action-thriller th.. When Bruce Willis exploded onto the big screen as John McClane, a smart, funny, one-of-a-kind New York City cop who lands in one-of-a-kind-predicaments, millions of fans worldwide cheered him on, and the bar for action films was forever raised! Die Hard: In the action-thriller that started it all, Bruce Willis makes his debut as John McClane, a New York cop battling terrorists in an L.A. skyscraper. Die Hard 2: Bruce Willis returns as..
A true Hollywood superstar. One of the greatest movie characters of all time. When Bruce Willis exploded onto the big screen as John McClane, a smart, funny, one-of-a-kind New York City cop who lands in one-of-a-kind predicaments, millions of fans worldwide cheered him on, and the bar for action films was forever raised! Now available in one action-packed Blu-ray collection are all four Die Hard films, in stunning high definition. Die .. When Bruce Willis exploded onto the big screen as John McClane, a smart, funny, one-of-kind New York City cop who lands in one-of-kind predicaments, millions of fans worldwide cheered him on, and the bar for action films was forever raised! Now available in one action-packed collection are all four Die Hard films that took the world by storm! Die Hard: In the high-rise, high-stakes Die Hard series opener Detective John McClane, heads f.. Die Hard: In the high-rise, high-stakes action thriller that raised the bar for the genre, superstar Bruce Willis rocks as New York City detective John McClane, who's in Los Angeles to spend the holidays with his estranged wife Holly (Bonnie Bedelia). But while McClane waits for Holly's office party to end, terrorists take control of the building. As their sinister leader, Hans Gruber (Alan Rickman), and his savage henchman (Alexander G..
A true Hollywood superstar. One of the greatest movie characters of all time. When Bruce Willis exploded onto the big screen as John McClane, a smart, funny, one-of-a-kind New York City cop who lands in one-of-a-kind predicaments, millions of fans worldwide cheered him on, and the bar for action films was forever raised! Die Hard: In the action-thriller that started it all, Bruce Willis makes his debut as John McClane, a New York cop b..
Bruce Willis returns as John McClane, an off-duty cop who is the wrong guy in the wrong place at the wrong time. On a snowy Christmas Eve, as he waits for his wife's plane to land at Washington's Dulles International Airport, terrorists take over the air traffic control system. It's now up to McClane to take on the terrorists, while coping with an inept airport police chief, an uncooperative anti-terrorist squad, and the life of his wif..
Superstar Bruce Willis (Sin City, The Sixth Sense) takes nonstop action and narrow escapes to the ultimate extreme in Die Hard With A Vengeance - now more explosive than ever on Blu-ray. Beleaguered NYC Detective John McClane (Willis) faces his worst day yet when a new foe (Jeremy Irons - Casanova) wreaks havoc in downtown Manhattan - then threatens more devastation if his demands aren't met! Caught in a sadistic game of hide-and-seek, ..
Superstar Bruce Willis (Die Hard, The Sixth Sense, Unbreakable) is back on duty as Detective John McClane - about to face his greatest challenge ever in this action-packed blockbuster hit. In New York City, McClane’s newest foe (Jeremy Irons - The Man In The Iron Mask) wreaks havoc in downtown Manhattan - and then reveals that more destruction throughout the city will follow if his demands are not met. Caught in a twisted game of hide a..
Bruce Willis is back as John McClane, a New York cop ready to deliver old-school justice to a new breed of cyber terrorists. When a massive computer attack on the U.S. infrastructure threatens to shut down the entire country over Independence Day weekend, it's up to McClane to save the day once again. Special Features Audio Description, Analogue Hero In A Digital World: Making Of Die Hard 4.0, Fox Movie Channel Presents Fox Legacy, Fea..
Bruce Willis is back as John McClane, a New York cop ready to deliver old-school justice to a new breed of cyber terrorists. When a massive computer attack on the U.S. infrastructure threatens to shut down the entire country over Independence Day weekend, it's up to McClane to save the day once again. Special Features Audio Description, Audio Commentary With Bruce Willis, Director Len Wiseman And Editor Nicolas De Toth, Deleted And Ext..
Get ready for more mind-blowing, heart-stopping, rip-roaring action with this harder edition that includes hours of thrilling extras plus a Harder, Extended Cut of A Good Day To Die Hard with intense new footage not shown in cinemas! Bruce Willis is back in action - as John McClane, the heroic New York cop with a knack for being in the wrong place at the wrong time. John's latest predicament takes him all the way to Russia to track down..
Get ready for more mind-blowing, heart-stopping, rip-roaring action with this harder edition that includes hours of thrilling extras plus a harder, extended cut of A Good Day To Die Hard with intense new footage not shown in cinemas! Bruce Willis is back in action as John McClane, the heroic New York cop with a knack for being in the wrong place at the wrong time. John's latest predicament takes him all the way to Russia to track down h..
Bruce Willis is back in action - mind-blowing, heart-stopping, rip-roaring action - as John McClane, the heroic New York cop with a knack for being in the wrong place at the wrong time. John's latest predicament takes him all the way to Russia to track down his estranged son, Jack (Jai Courtney), who has been imprisoned in Moscow. But the mission takes a deadly turn as father and son must join forces to thwart a nuclear weapons heist th..
Bruce Willis is John McClane, a New York cop who flies to L.A. on Christmas Eve to visit his wife at a party in her company's lavish high-rise. Plans change once a group of terrorists, led by Hans Gruber (Alan Rickman), seize the building and take everyone hostage. McClane slips away and becomes the only chance anyone has in this heart-stopping action thriller. Special Features Commentary By Director John McTiernan And Jackson De Govia..
Bruce Willis is John McClane, a New York cop who flies to L.A. on Christmas Eve to visit his wife at a party in her company's lavish high-rise. Plans change once a group of terrorists, led by Hans Gruber (Alan Rickman), seize the building and take everyone hostage. McClane slips away and becomes the only chance anyone has in this heart-stopping action thriller. 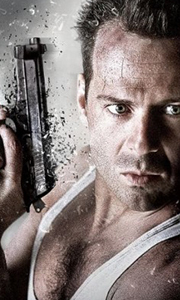 Special Features Die Hard Featurette, Cast Biographies, Theatrical Thriller..